﻿Molecular Enzymology and Drug Targets journal aims is to publish the work of designing and synthesis of enzymes and high unmet medical need are based on innovative drug targets. This is an international journal for rapid dissemination of significant data related to enzymes and their use in biotechnology and drug discovery. The basic enthusiasm of the journal is publishing new data related to the molecular aspects of enzymes, cellular lipid metabolism, biocatalysis, enzyme mechanisms and cellular functions in broader aspects of biology. Molecular Enzymology's interest include in all aspects related to enzymes like discovery of enzymes, enzyme structure, enzyme mechanisms, cellular and metabolic functions of enzymes, exploitation of enzymes for biotechnological and pharmaceutical applications, Enzymology, drug discovery, biochemical aspects of enzymes, bioinformatics, computational analysis, molecular modelling studies, new methods in enzyme expression and purification, biocatalysis, biomolecular engineering, enzyme kinetics and inhibitors. In spite of the great work done in the field of enzymes but there is no specific journal interested in enzymology and in related areas of drug discovery. 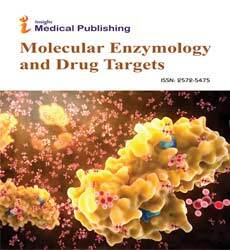 Therefore, the journal Molecular Enzymology and Drug Targets will be unique in its discipline as it can be the first interest to authors working in the field of enzymology and related subjects. The journal is an interdisciplinary medium serving several branches of life sciences. This Journals publishes original articles, short communications, notes, and mini reviews. Full length reviews are only published after invitation from the editorial board. Preliminary studies are inappropriate for publishing in ﻿Journal ﻿of Molecular enzymology and Drug Targets, unless the authors report the significance of their findings, in that case, the manuscript can be accepted. Average first decision of submitted manuscript is expected to be 14 days. Enzymes are proteins processing cellular metabolism. They can affect a reaction by catalyzing and they can be used to reverse the reaction in bio-chemical pathways. Though enzymes have complex enzyme structure they undergo many changes which is very important for reactions and so enzyme structure is very important. There is a specific enzyme for specific reaction. Enzymes structure are made up of α amino acids which are linked together via amide (peptide) bonds in a linear chain. This is the primary structure. The resulting amino acid chain is called a polypeptide or protein. The specific order of amino acids in the protein is encoded by the DNA sequence of the corresponding gene. Enzymes are proteins, enzyme engineering is a part of the larger activity of protein engineering. Enzyme engineering utilizes recombinant DNA technology to introduce the desired changes in the amino acid sequences of enzymes. Molecular Enzymology's interest include in all aspects related to enzymes like discovery of enzymes, enzyme structure, enzyme mechanisms, cellular and metabolic functions of enzymes, exploitation of enzymes for biotechnological and pharmaceutical applications, drug discovery, biochemical aspects of enzymes, bioinformatics, computational analysis, molecular modeling studies, new methods in enzyme expression and purification, bio catalysis, bio molecular engineering, enzyme kinetics and inhibitors. Drug transporters are also proteins that transport drugs into or out of cells by up taking or refluxing the drugs. There are many types of drug transporters include some enhance the activity of the drug and some reduce the activity of the drug in process like metabolism, respiration etc. Altered drug transporter function, whether due to genetic polymorphisms, drug-drug interactions, or environmental factors such as dietary constituents, can result in unexpected toxicity. Such effects are in part due to the interplay between various uptake and efflux transporters with overlapping functional capabilities that can manifest as marked interindividual variability in drug disposition in vivo. Journal of Developing Drugs, Drug Designing: Open Access,International Publisher of Science, Technology and Medicine, Advanced Drug Delivery Reviews, American Journal of Drug Discovery and Development, Arzneimittel-Forschung/Drug Research, Assay and Drug Development Technologies, Biopharmaceutics and Drug Disposition, Cardiovascular and Hematological Disorders - Drug Targets, Chemical Biology and Drug Design,Clinical Pharmacology in Drug Development, Critical Reviews in Therapeutic Drug Carrier Systems, Current Cancer Drug Targets, Current Drug Delivery, Current Drug Targets. Journal of Developing Drugs,Drug Designing: Open Access,International Publisher of Science,Technology and Medicine, Infectious Disorders - Drug Targets, Inflammation and Allergy - Drug Targets, Cardiovascular and Hematological Disorders - Drug Targets, Current Cancer Drug Targets, Current Drug Targets. Targeted drug therapy is mostly done in cancer which involves in targeting the cells that are associated with the disease in promoting growth, progression and the spread of the disease.Drug target as a nucleic acid or a protein (e.g. an enzyme, a receptor) whose activity can be modified by a drug. The drug can be a small-molecular-weight chemical compound or a biological, such as an antibody or a recombinant protein. The drug target should have been shown to be effective/mechanistically involved in the disease by relevant in vitro or in vivo models. The therapy is done by identifying the targets which is very important in the treatment of disease. Targeted drugs attack the targets or infected cells as a procedure of therapy. Journal of Developing Drugs, Drug Designing: Open Access,International Publisher of Science, Technology and Medicine, Infectious Disorders - Drug Targets, Inflammation and Allergy - Drug Targets, Cardiovascular and Hematological Disorders - Drug Targets, Current Cancer Drug Targets, Current Drug Targets. Infectious disease drug targets are the drugs that stop the growth of the cells and spread of the infection by targeting the infection causing cells in the body. Many new anti-infective drugs are developed in drug discovery process. Receptors are the proteins located on the surface of the cell and inside of the cell act as drug targets by regulating the cellular process. Receptor drug targets help the drug to show its effect in various disease stages. Anti-retroviral drugs targets the cells in various stages of HIV life cycle and in drug discovery process many new Anti HIV drugs has been discovered by using the small differences in normal cells and infected cells. In this system the drug is delivered to the patient concentrating that the drug should release in the targeted sites of the body. This increases the safety and reduces the side effects by decreasing the release of drug concentration in not targeted sites. Transcription is a step in the production of proteins by transforming the segment of DNA to RNA which is called as mRNA. RNA polymerase is the enzyme used in this process. Transcription is the beginning in production of proteins. Biochemistry & Molecular Biology Journal, Biochemistry & Analytical Biochemistry,Advances in Protein Chemistry and Structural Biology,Amino Acids, Peptides and Proteins,Biochimica et Biophysica Acta - Proteins and Proteomics,Current Protein and Peptide Science,Current Protocols in Protein Science,Current Topics in Peptide and Protein Research,Probiotics and Antimicrobial Proteins,Protein Engineering, Design and Selection,Protein Expression and Purification. Translation is the process followed by transcription in the synthesis of amino acids. In the process of protein synthesis mRNA molecule sequence is translated to amino acids sequence. Thus ribosome forms protein through the translated mRNA. The information in DNA is transferred to a messenger RNA (mRNA) molecule by way of a process called transcription. During transcription, the DNA of a gene serves as a template for complementary base-pairing, and an enzyme called RNA polymerase II catalyzes the formation of a pre-mRNA molecule, which is then processed to form mature mRNA. Uncompetitive inhibition is the process when the uncompetitive inhibitor binds to the enzyme-substrate complex only. This process increases the availability of substrate as the uncompetitive inhibitor stops the reaction between enzyme and substrate. Noncompetitive inhibition is the process that noncompetitive inhibitor binds to enzyme substrate complex. Thus the reaction between enzyme and substrate slows down. In noncompetitive inhibition, a molecule binds to an enzyme somewhere other than the active site. This changes the enzyme's three-dimensional structure so that its active site can still bind substrate with the usual affinity, but is no longer in the optimal arrangement to stabilize the transition state and catalyze the reation. Certain enzymes bind to the certain substrates only. There are 4 types of specificity, they are absolute specificity, group specificity, linkage specificity and stereochemical speficity depending on their steric sites, number of reactions they undergo, groups, type of bond they form. The substrate is relatively smaller than the enzyme. Therefore, the substrate is binding with a portion of the enzyme. The substrate is attached to the enzyme with weak bonding forces such as hydrogen bond, electrostatic interactions, and dipole-dipole interactions. The substrates are usually complementary to the enzymes. However, it is possible that they do not fit perfectly each other. These bonding forces help the complex to be more stable. In the case of two substrate reactions involving ternary complex, two substrates must be bound close to each other to precede the reaction. It is impossible to proceed the reaction if two substrates are not adjacent or close each other spatially. From the case, the enzyme should have some steric specificity. When the substrate repel to water then that interaction is known as hydrophobic interaction and the contact angle between water and substrate will be more. The tendency of nonpolar molecules in a polar solvent (usually water) to interact with one another is called the hydrophobic effect. The interactions between the nonpolar molecules are called hydrophobic interactions. Journal of Developing Drugs,Drug Designing: Open Access, International Publisher of Science, Technology and Medicine, Advanced Drug Delivery Reviews, American Journal of Drug Discovery and Development, Arzneimittel-Forschung/Drug Research, Assay and Drug Development Technologies, Biopharmaceutics and Drug Disposition, Cardiovascular and Hematological Disorders - Drug Targets, Chemical Biology and Drug Design, Clinical Pharmacology in Drug Development, Critical Reviews in Therapeutic Drug Carrier Systems, Current Cancer Drug Targets, Current Drug Delivery, Current Drug Targets.